* NEW DOG PARK UNLEASHING: On Thursday, Sept. 6 at 6 pm, the new "Bark and Go Dog Park" on H Street SE east of New Jersey Avenue (across from THAT not-yet-open grocery store) will have its official "Unleashing Ceremony." All are invited. * DACHA UPDATE: This tweet reports that the latest "Beer Me" podcast says that Dacha Navy Yard is shooting for a "tentative soft opening" this winter, with a grand opening in March of 2019. It will be 4,000 square feet inside and double that outside (because it's, you know, a beer garden.) It will be in the ground floor of the Dock 79 apartment building across from Nats Park, alongside The Salt Line and All-Purpose. @RMP: Cap Riverfront and other Googleable websites shed a bit more light. Morini’s not the only nearby source of grub and liquid refreshment. There’ll apparently be music. The beneficiary is the charitable endeavor Project Sunshine. JD, please give us a hint on your location. The photo has some clues, but not enough. Where in the World Is JD? Ummm... It's where the deer and the antelope play? Any update on when Wiseguys Pizza might be opening? Looks pretty finished? 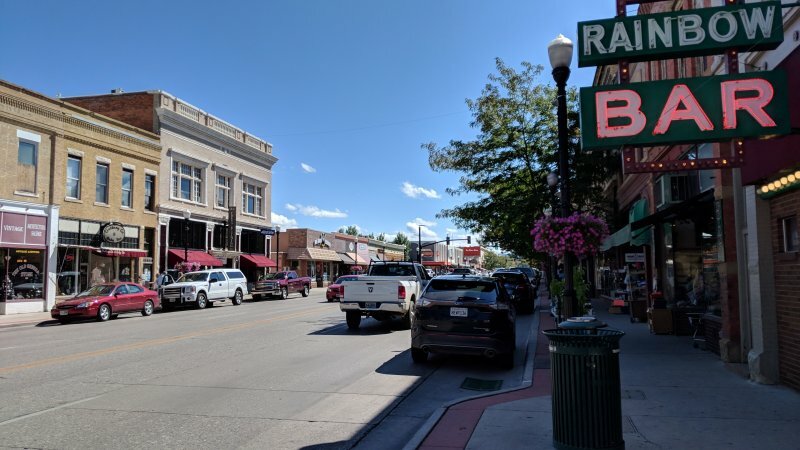 JD is in Sheridan, Wyoming. The bulb out is complete and now Harris Teeter is a nightmare to get out of. They also changed the arrow signage in the underground HT parking lot, so now there are two separate lanes of traffic to get out of the exit. Cars zipper in one at a time when people feel polite. The southbound lane on 4th has about half a car of space from the parked cars next to the curb. IMPORTANT— my wife was walking to work this morning and saw someone’s pet blue parakeet sitting by a tree on NJ Ave, next to the Capitol Hill Tower/Marriott. If you lost your pet, hopefully it is still there. There is some pretty serious flooding at the Yards Park boardwalk, including next to Due South dockside and Morini. This is the second serious flooding this year but noneed to worry, however, because Dear Leader has assured us that global warming is a Chinese hoax and we’re doubling down on 19th century coal instead of investing in clean, renewable, energy. Here's a couple of photos of the flooding at Yards Park. Hopefully there isn't too much storm surge with the hurricane later this week. As of 5:30pm today, Moroni/Due South boardwalk floodwaters have receded. Everyone who safely evacuated is invited back for the rebuilding effort. It may be minutes before things ever get back to normal. Whoa, whoa, whoa, JD! Any news you'd care to share with us about potential development in the neighborhood? @202, I know nothing. Just read the Post article about the whole Amazon board coming to town. Tell you what, I'll just buttonhole Jeffy in the hallway at work on Friday and ask him to tell me. Boardwalk Block Party rescheduled for Sunday October 7. DC VegFest cancelled due to impending hurricane. It's a rain or shine event, but DC State of Emergency forced them to cancel. Unfortunately, it will not be rescheduled. With all of the discussion of the catastrophic flooding, the lost parakeet, and your planned Jeffy B. meeting, I forgot to mention yesterday that it looks like there is construction activity on the lot off of L St, between the WMATA chiller plant and the parking lot. Here’s hoping to more tower cranes in the coming months! @202 - yes, looking down onto the site from 1015 Half Street it appears they've dug a large rectangular hole and also dug a trench along the perimeter of the property's western boundary. I also see stacks of plastic piping and wood. Barre3 emailed its founding members to say opening is tentatively set for September 24. "This work is heavily dependent on favorable site and weather conditions in advance and during this work activity. This nighttime activity could be moved to later in the week based on the weather." Brand new bikeshare station across from Gordon Biersch at 1st and M!!! I am selfishly super excited. Even seems to have a key dispenser! And new bikes; I took one out for a brief joyride. @JD I'm pretty sure it's just an extra one--my bikeshare app still shows the 1st and K and Starbucks docks. Looks like Clark is bringing in another crane for 88 K. Closures on half st happening this weekend. Looks like the start of a second crane is being built at Square 696 (Congressional Square) on the half street end of the hole in the ground. I've watched a lot of buildings go up, and I can't believe how fast both 696 and 1000 1st are already going vertical. 18-8's bailing was mentioned in spring. So too far back for scrolling! Posted on twitter that permanent signage is up at Wise Guys/Altani: link Also Barre3 emailed to say they are targeting September 24 for opening. Plus maybe we should do a group shopping trip at THAT store when it opens. Oct. 11 would be my preference. There is an event already scheduled for Oct. 4. @JD: Make that a flash mob shopping trip to TSFKAWF and I’m all in. If someone else wants to choreograph and organize rehearsals, I can suggest some Prince tunes that are NSFWF and won’t stress anyone still recovering from hip surgery. October 11 is good date for me as well -- looking forward to meeting up! JD-- how did your meeting with Jeffy B. go on Friday? Thought I saw a dumpster on a flatbed parked at old GSA warehouse this morning - finally beginning process of abatement and then demolition? If so, that's a lot of construction at this corner of JD Land. @jdc-- let's do some dumpster diving this evening!!! The only dumpster I'd dive in is at Jeff B's digs. I bet he tosses nice stuff. The GSA warehouse isn't being demolished. This is the bldg permit description: "Interior and exterior alterations and repair to the building to include the removal of the top portion of the building down to 4' above grade, waterproofing, enclosure of the L shaped stair to cellar level, and enclosure of the chimney to create an 'open uncovered parking' lot." Also, jdc/202, the 37 L Street site (next to the Chiller site) doesn't have any excavation or foundation or building permits approved yet. The first meeting, on Tuesday, Sept. 25, is from 6:30 to 8:30 pm at 3100 MLK Jr. Ave, SE, in Congress Heights. The second meeting, on Wednesday, Sept. 26, is from 6:30 to 8:30pm at the King Greenleaf Rec Center at 201 N St., SW. The same information will be presented at both meetings, and the project overview portion of the agendas is scheduled to start at 6:45 pm each day. Folks, I have some unfortunate news to report. The tower crane for the West Half Street is being removed this morning. It looked like such a sad, pathetic, little thing when they were disassembling the crane. @greb22-- They are mostly done with the structure of the building and are installing windows now. These cranes are probably expensive to lease. JD-- I saw that you re-tweeted it but there is a big fire at the senior housing on 5th Street SE. I hope there are no injuries or fatalities. So GSA warehouse is essentially being razed and turned into a temporary parking lot ("the removal of the top portion of the building down to 4' above grade"). If it's not excavation per se, they're definitely doing a lot of digging at that site.